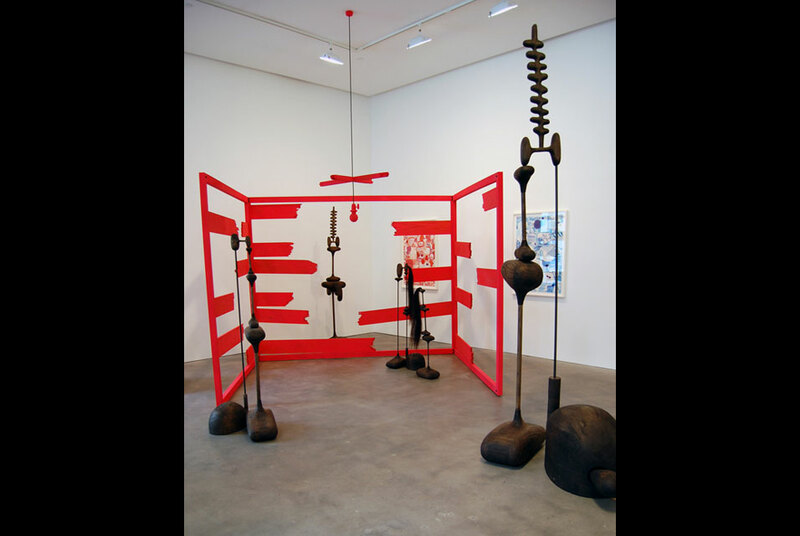 Eric Fertman, Installation View 2010, Susan Inglett Gallery, NYC. Photo: Courtesy Susan Inglett Gallery, NYC. NEW YORK, NY.- Susan Inglett Gallery presents the work of Eric Fertman in his second solo exhibition with the Gallery. The show consists of sculpture and works on paper. We look onto a darkened stage with sets built of battered planks, hot pink, sheltering a ragtag collection of apparitions and shades. Shadows to solids, this mysterious band of umbraes would be impossible to identify were it not for the characteristic tilt of the head, the isolated gesture, the defining bulge. We look for the familiar clues, seeking to fill the void and projecting bits of ourselves onto their blank screen. These props or sculptures become receptacles for our most private thoughts and memories, dream-catchers for the insomniac. Eric Fertman graduated from Cooper Union in Manhattan. His work has been seen at the Sculpture Center, Museum 52, Guild and Greyshkul, in Off the Books! curated by Benjamin Degen and the Brucennial with the Bruce High Quality Foundation. In his artist´s statement he says: My goal is to thoughtfully construct objects that have both a logic and peculiarity. They should be correctly assembled, but in their own alien language. I am influenced by the Soviet Constructivists, Dziga Vertov's films and especially Kazimir Malevich's Suprematism. Philip Guston has also had an impact on my work which I hope is strangely evident. Chinese and Japanese art also attract me. Chinese scholar's rocks are especially appealing. They are appreciated as natural objects, but are the result of careful shaping and mounting. A truly great rock does not resemble anything but itself; it becomes an object which cannot be understood except for it's eccentricities. This is what I try to cultivate in my own sculpture. My method is to combine ordinary and fantastic elements. I am attracted to forms that possess both these traits. Nature alone is not sufficient. Imagination alone is not sufficient. Only in combination are they satisfying to me. The shapes I have selected, for instance, a landscape/fungus/hotdog shape and a box shape, have been chosen not only as novel forms but also to establish a certain standard. The combinations are not random, but I hope they are appreciated for themselves, not for what they resemble. They are a catalog of carefully imagined original tastes. I am trying to create a vocabulary which follows rules but that speaks beyond logic. Craftsmanship is a device to express that vocabulary clearly. I try to use no more or less of it than necessary. The level of craftsmanship in my sculptures only matches what I am trying to express. I hope to make things that are funny. Playfulness is important to me. I want you to see the awkward innocence of my sculpture, but I hope it's offset by my darker intentions. I want to invent humorous forms; to me, some shapes are just funnier than others.